On 15th November 2016, co-chairs of the APPG for International students, Paul Blomfield MP and Lord Bilimioria welcomed Jo Johnson, Minister for Universities, Science, Research and Innovation to the first formal meeting of the APPG since it was formed in May 2016. 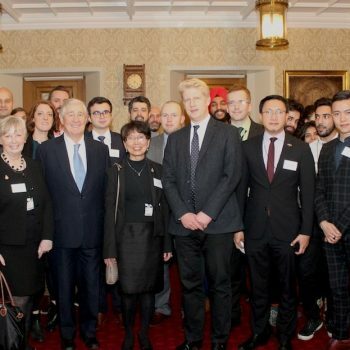 The meeting, held in the House of Lords, discussed the role government and the education sector could take in ensuring international student numbers in the UK were able to match global growth. Jo Johnson informed APPG members on the government’s future plans to promote UK Higher education globally. Rebecca Hughes, Head of Education at the British Council was also invited to discuss the role of the British Council and the wider sector in supporting international students for both ‘quality applications and quality students’. APPG members and supporters welcomed the Government’s commitment to increasing international student numbers in the UK through the Education is GREAT Campaign but remain concerned that a lack of coordination between government departments means negative messages about the UK are still being sent to students. Jo Johnson assured members there is no intention of a cap on the arrival of international students to the UK. He noted his recent trip to India with the Prime Minister and APPG Committee, and emphasised the UK maintained a strong global presence in the rankings, referencing its extraordinary statistics. Johnson stated “We can go round confidently saying there’s no better place in the world to study than the UK”. Sector representatives and Members of the APPG remained concerned that immigration policies were damaging the UK reputation abroad. They argued that more needed to be done to ensure that our immigration systems were not more complex and restrictive than our main competitors such as the US and Australia. They also expressed concern that the Home Office’s announcements of policies and consultations are rarely concerned with protecting the reputation of the UK and must be more careful how they are viewed by prospective students. In particular the recent announcement of a consultation on differentiating between universities and colleges in the Tier 4 sponsor system might suggest we have ‘poor quality’ universities and colleges when quality regimes show quite clearly that students across institutions receive a very high quality education. Members agreed there is a clear need to ensure the UK’s immigration, international trade and education policies are all working together. Co-Chair Paul Blomfield MP has welcomed many international students in his Sheffield Constituency. “We need to send a clear message that the UK remains a globally facing country and warmly welcomes students from around the world. The next meeting will be held in 2017.